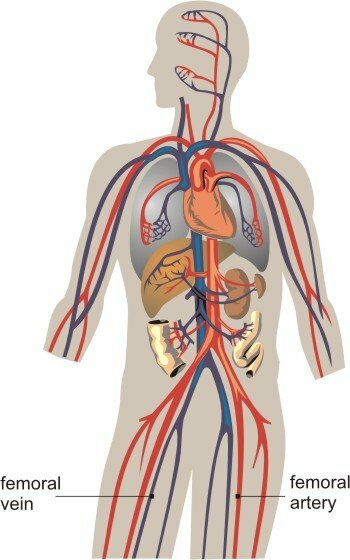 The femoral blood vessels are important conduits for blood traveling between the heart and lower limb. The femoral artery carries blood to the lower limb while the femoral vein carries blood back to the heart. These structures are common sites for conditions that cause narrowing or blockage of the blood vessels. Atherosclerosis cause plaque formation within the artery and blood clots (thrombus or embolus) may affect both the artery and vein, although it is more likely to occur in the vein due to slower blood flow. The femoral artery enters while the femoral vein leaves the thigh just under the inguinal ligament. It lies quite superficially at this point in an area known as the femoral triangle. This is a common site for surgeons to enter these vessels for a number of intravascular surgical and diagnostic procedures. The apex of the triangle is therefore formed at the point where medial border of the sartorius crosses the lateral border of the adductor longus muscle. What is the Femoral Artery? The femoral artery is the main blood vessel that carries oxygen-rich blood from the heart to the lower limb. It is a continuation of the external iliac artery, which is the more superficial branch of the common iliac artery that arises as a bifurcation of the abdominal aorta. As the external iliac artery passes below (inferior) the inguinal ligament, it becomes known as the femoral artery. The pulsation of the femoral artery (femoral pulse) can be felt in the middle of the femoral triangle. 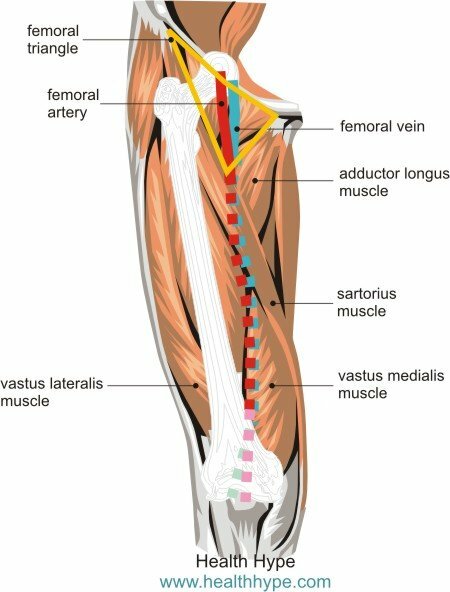 The femoral artery descends anteromedially (front-inner) in the thigh, within the adductor canal, and ends when it passes through the adductor hiatus (gap between the adductor magnus muscle and femur). From this point onwards, the femoral artery is known as the popliteal artery and passes down the back of the knee. Deep artery of the thigh (arteria profunda femoris) is the largest and main branch of the femoral artery and branches off the femoral artery about 2 to 5 cm below the inguinal ligament. Medial circumflex artery and lateral circumflex artery may arise from the deep artery or directly from the femoral artery. What is the Femoral Vein? The femoral vein is the main blood vessel that carries oxygen-deficient blood out of the lower limb and back to the heart. It is a continuation of the popliteal vein and becomes known as the femoral vein proximal to the adductor hiatus. The femoral vein follows the course of the femoral artery, first lying behind and to the side (posterolateral) of the femoral artery when behind the knee and then runs behind (posterior) to the artery as it travels up the adductor canal. It continues up the thigh lying medial to the femoral artery within the femoral sheath that traverses the femoral triangle. Above the inguinal ligament, the femoral vein continues to become the external iliac vein which joins to the common iliac vein and empties into the inferior vena cava.